The cotyledons of a tulip tree (Liriodendron tulipifera) emerging from east Tennessee soil in 1970 would have by now produced an imposing tree, approaching a half century in age. Nineteen-seventy also would see a young PhD candidate from middle Tennessee arrive on the University of Tennessee, Knoxville campus and begin his studies in the botany department. This past summer that young graduate student, Research Associate Professor B. Eugene Wofford (Gene), stepped down as full time director of the University of Tennessee Herbarium, leaving a legacy as one of the most accomplished botanists to graduate, teach, and conduct his research through the UT Department of Botany, (now the Department of Ecology & Evolutionary Biology). To celebrate Gene’s career is to recognize his many contributions to Tennessee botany, where he studied one of the most diverse floras in the world. He mastered this diverse flora and authored or co-authored four of the most definitive treatises of the flora of Tennessee, including A Guide to the Vascular Plants of the Blue Ridge, Guide to the Trees, Shrubs and Woody Vines of Tennessee, Woody Plants of Kentucky and Tennessee, and The Guide to the Vascular Plants of Tennessee; a work guided by Wofford with the Tennessee Flora Committee. Perhaps surpassing his written accomplishments through his books and scientific papers is his lifetime of collaboration with his botany peers worldwide through his directorship of the University of Tennessee Herbarium, one of the top 25 Herbaria in the United States and the primary repository of plants collected from Tennessee and the Great Smoky Mountains National Park. Few can retire knowing they left a true legacy, but one only has to look at all the UT graduates Wofford taught and mentored who now continue the legacy of Tennessee botany as professors, researchers, and environmental professionals throughout the greater Southeast to recognize his lasting legacy. 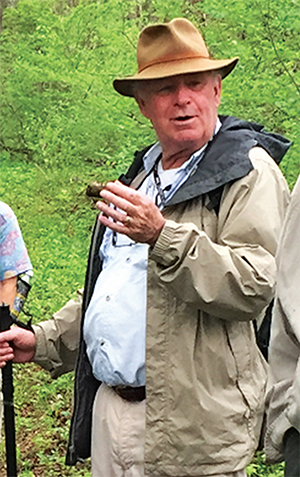 Wofford also leaves his mark through his leadership of the Spring Wildflower Pilgrimage, the Association of Southeastern Biologists, and the Southern Appalachian Botanical Society, which honored him with their most prestigious award, the Elizabeth Ann Bartholomew Award, in 2004. As scientific technologies change, as climates change, and as scientific understanding changes, the value of botanical collections to the sagacious is becoming even more apparent. Thank you, Gene, for your stewardship of Tennessee botany and the collections housed in the UT Herbarium.